The decision behind moving office may occur for a number of reasons – it may be the end of the lease, the company has expanded and needs additional space, or perhaps a downsize makes financial sense. Whatever the reason, Quick & Easy Moving provide an expert office relocation service with minimal disruption to your business. We understand that time is money, and the more downtime you have, the more money it will cost you dollar wise by not performing your business or service, as well as the cost in wages to staff on hand. That is why we offer both weekend and overnight relocation services, where we can move your entire office and make sure you are up and running by the next working day, keeping any disruption to your core business, or staff to a minimum. Our experienced office movers meet with you in advance, and discuss the entire logistics behind the move, ensuring everything has been planned out, no matter how small the detail, and that nothing will slip through the cracks. We offer a free and no-obligation quote and can assist with tailoring a plan to meet your needs. Our polite and professional office movers will begin the pre-planning phase in consultation with you and will assist in preparing a comprehensive moving list guide to let you know well in advance what is required. We will also do a walk through of the actual space with you, to plan specific details of the move, and ensure that everything is done perfectly without a hitch. After the planning has been completed, it’s now time to prepare your office to be relocated. We will arrange delivery of all the packing supplies directly to your office well in advance, leaving you ample time to pack without disrupting your business’ day-to-day operations. You will receive all the necessary equipment, such as cartons, containers, carts and inventory tags to accommodate all of your computers and company servers, electronics, files, as well as any artwork, mirrors, plants and miscellaneous items. Our experienced movers will assist with packing all of the large and delicate items before moving office, which includes fax machines, copiers, furniture, and pictures. We also will help pack computers and monitors. By utilizing library carts, it allows us to quickly transport items, and ensure the integrity and order of the process. The movers then pre-load the items from the carts onto dollies on moving day allowing for quick and easy elevator use. In the days before the scheduled move date, we label each item including cartons and furniture based on the custom floor plans of your new office. When moving office, you can count on Quick & Easy Moving to adhere labels and stickers in each office and open space of the new location, to ensure that we correctly place all cartons and furniture into the right place on moving day and that nothing is misplaced. As per the prearranged moving day, our well-trained office movers will arrive on the scheduled day, on time and ready to start working to full efficiency. The office move supervisor will oversee the whole process, and movers will use only careful and industry best methods of transport, to ensure all of your items arrive on time and intact at the location of your new business office. As well as taking care of the furniture, and office equipment, we also protect the physical building, both at the old office and the new location. We use pads and runners for the floors and walls to ensure the building is protected from any damage during the moving process. After we have arrived at your new office, our team gets straight to work having your new location up and running and operational ASAP. 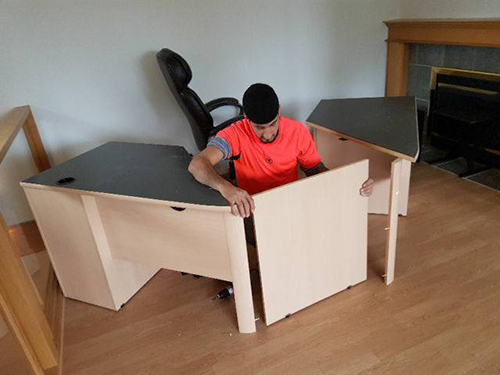 Our office movers unwrap all of the furniture and equipment and place and locate it to your satisfaction. Our priority is to make sure you and your employees get back to work as soon as possible while keeping the disruptions to your business as minimal as possible.